Carbon Poker is sending their players to Super Bowl XLIX with more than $10,000 to win this NFL season. To be one of the lucky players, all you need to do is pick the winner of a 2014 Monday Night Football game and then dominate on the poker table. Login to your player admin and you will find ‘Game of the Day‘. Submit your pick for any Monday Night Football this season and battle agains the other winners in a Tuesday night freeroll. Pick a straight up winner of the Monday Night Football game and you will be eligible for a weekly freeroll. The Top 3 finishers of the weekly Super Bowl Freeroll will have a seat secured for the Super Bowl Championship instantly. 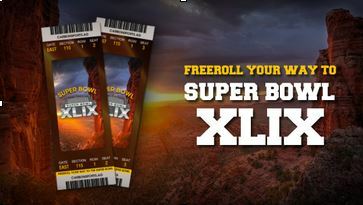 Win the Super Bowl Champion Freeroll and you will be awarded two tickets to Super XLIX in Arizona and $2,000 cash! Moreover, if you finish in the Top 3 of the weekly freeroll, 1,500 chips will be added to your stack in the final freeroll. Grow your stack by finishing in the Top 3 every week.